Claire, Caitlan, Sondra, and Rachel enjoying the Ice Cave! Even though it is spring and we just saw our first robin in the driveway of Amil’s Inn Bed and Breakfast, the Ice Cave at Wildcat Mountain State Park, Ontario, Wisconsin still looks like winter. The Ice Cave is actually an eroded sandstone formation that appears to be a cave when approaching. However upon closer inspection you will find a shallow depression in the rock with a small spring running over the upper edge. During the winter, this spring water freezes into a giant icicle. 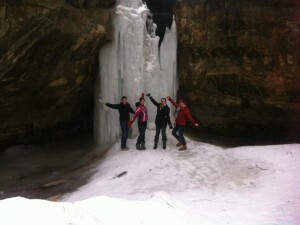 Our daughter and 4 of her friends made a recent visit and as you can see, there still is much ice to enjoy. Actually the the iceicle can last into May depending on the spring weather! The Ice Cave is just off County Highway F, south of State Highway 33. This is the entrance and parking area to the Ice Cave picnic area and trail. The Ice Cave is approximately ¾ mile from the picnic area and you will be hiking along the banks of Billings Creek. Now would be a great time to plan your trip to Wildcat Mountain State Park.